Adding members into teams has now been changed to allow easier filtering to help you find the members that you are looking for. 1. From the dashboard menu Hover over the teams tab and click team. 2. You will see a list of the teams. To select a team click the magnifying glass to the left of the team name. 3. 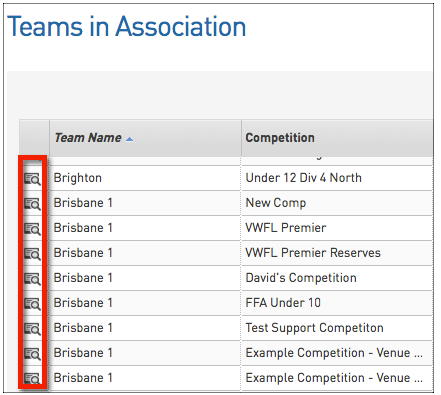 From the team menu hover over the members tab and click modify team list. 4. You will then be brought to a screen which displays all the available filters. 5. To filter by season click the word Season to open the drop down menu. 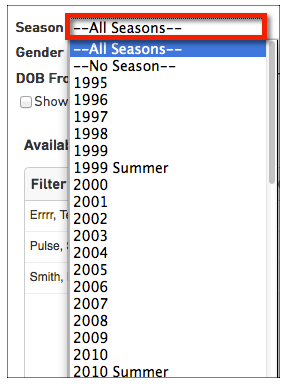 By selecting a season only members within that season will be displayed. 6. To filter by gender click the word None Specified to open the drop down menu. By selecting a gender only members of that gender will be displayed. 7. To filter by date of birth (DOB) click the box next to the words DOB From to open the date picker. By selecting a DOB only members within that date range will be displayed. 8. You can also select to show only members who are unassigned to other teams. To do this tick the box next to show only unassigned members. 9. You are also able to filter members by name. To do this simply type in the member name that you are searching for in the search box next to the word Filter. 10. Once you have found the members that you are searching for and want to add them to a team click the Plus symbol to the right of the member name. 11. Once you have selected the members for the team you may find that you want to remove one of them from the team. To do this click the minus symbol to the right of the member name.